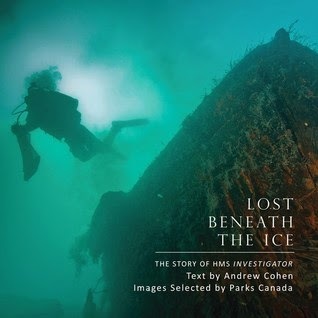 Lost Beneath the Ice is an absolutely fascinating and visually stunning look at The Story of HMS Investigator. Andrew Cohen begins by recapping the story of the Investigator and her crew, talking about how the came to be "fixed in the ice, inert and useless," for more than a year. Summer saw the depth of the ice actually increase 3 inches, pushing it over 7 feet in thickness, and the summer warmth only clouded their world in fog and mist. Cohen talks of joyless sailors weak from malnutrition, of bread thieves being whipped with a cat 'o nine tails, and of others going mad. Small openings in the ice only teased the sailors, sealing up before any attempt could be made to exploit them, leaving the Captain no choice but to divide the crew, keeping the weakest trapped but safe, while sending the strongest in search of help - over 600 miles away. It's at this point that Cohen steps back to talk about how just such a predicament could have occurred, recapping the history of arctic exploration, and detailing the Investigator's journey to its icy resting place. Finally, he picks up the story once again, a full year and a half after being stranded, and talks of the hope of rescue and salvation, of crossing 50 miles of ice to find a ride home on either the Resolute or the Intrepid . . . only to become trapped once more, less than 100 miles into their voyage home. It would be almost another year before the combined crews would make yet another voyage across the ice to hitch a ride home on the North Star. Where the story really gets interesting - for me, at least - is with the underwater archaeological expedition led by Parks Canada in 2010. Almost 160 years after the Investigator was abandoned, its final resting place is no easier to reach than it was back then. It took a series of flights on small engine planes and helicopters to reach their destination, "a place of polar bears and muskoxen." Remarkably, the ship proved easy to find, just 450 metres offshore, "in water so clear and shallow that the ship’s outline was visible from the surface when the sun came out." Included in the collection is a large number of historical artifacts, including hand drawn schematics of the Investigator, a copy of the ship's seal, densely hand written dispatches that made it across the ice, paintings depicting the ship and its crew, and a false account of the ship's discovery in a 1910 Austrian newspaper. The bulk of the book, however, is taken up with contemporary images of the search, investigation, and salvage of the Investigator. There's no doubt it's a cold and barren landscape, as seen in the lonely fields of wreckage and debris, but some of the images (such as the cataracts of Mercy Falls) are absolutely gorgeous. While the shots of the campsite look almost normal, as if you could just wander by and share a campfire, the images of the rubber dingy setting off into cold, foggy waters, surrounded by ice, gives you a good sense of what the crew must have endured. Ultimately, however, it's the photos of the shipwreck itself that I spent the longest time pouring over, scrutinizing every detail, and marveling at just how well preserved the ship remains, Lost Beneath the Ice. Yeah unfortunately I don't think this one would be my cup of tea.